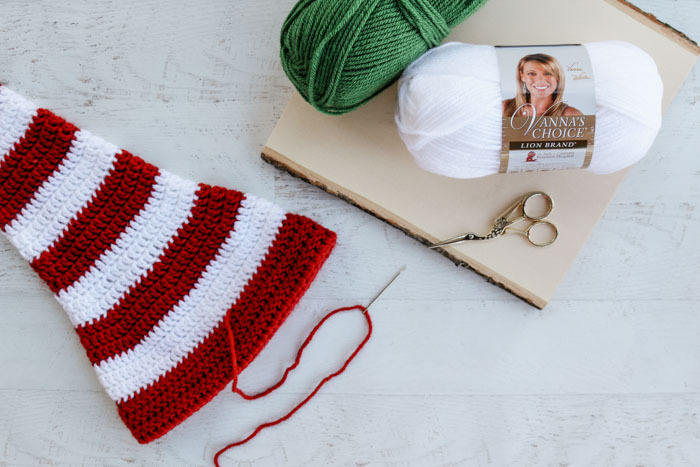 Whether you have upcoming Christmas photos or are planning a trip to the North Pole, this festive crochet elf hat with ears is a must for each member of the family. Get the free pattern in sizes newborn baby through adult below or purchase the ad-free, printable PDF for $2.99 here. UPDATE: This pattern was originally posted in December 2015 and it was my first original crochet pattern. I’ve learned a lot since then, so I’ve completely re-written the pattern with clearer instructions updated sizing and new photos. You can still find the original version of the pattern in the Subscriber Vault. 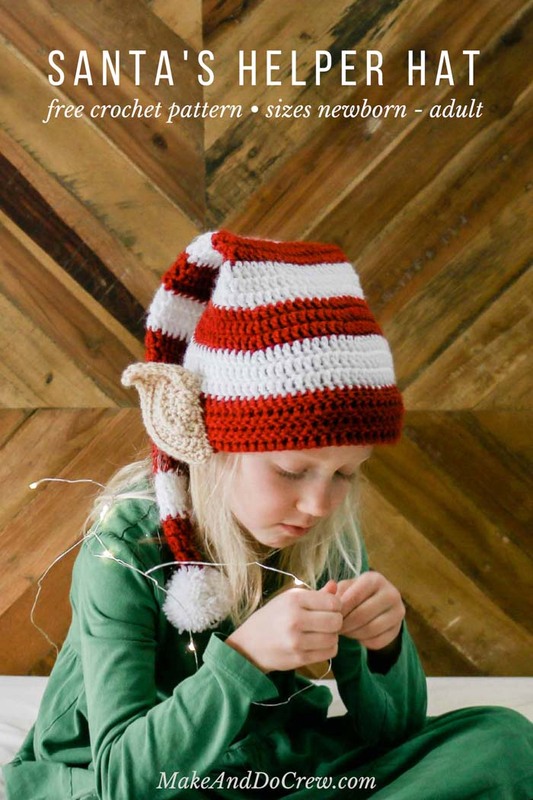 What is cuter than a crochet elf hat pattern? A crochet elf hat pattern with little pointy ears, of course! I tend to be kind of literal at times, so when I set out to create a free crochet elf hat pattern, I wanted to include all the details that make elves elf-y. The crochet elf ears went through a few iterations before I felt like I had gotten them right. Some looked like a blob of gum stuck to a shoe, others were too Yoda-like and some, quite frankly, looked like a different body part that would not be appropriate to sew onto a child’s hat. The final ears, though, are pretty darn charming. And each time my three-year-old wears this hat, the ears get a little more adorable. I think there’s something about how they get wrestled about when she’s putting the hat on (often backward) that has relaxed them into perfection. I love that everywhere we’ve gone this fall, my kids look like they’re on work release from Santa’s workshop. (And of course, no elf would be complete without a sidekick in a crochet snowman hat.) Having these crochet elf hats around hasn’t helped with the “Is it Christmas yeeeeet?” questions around our house. 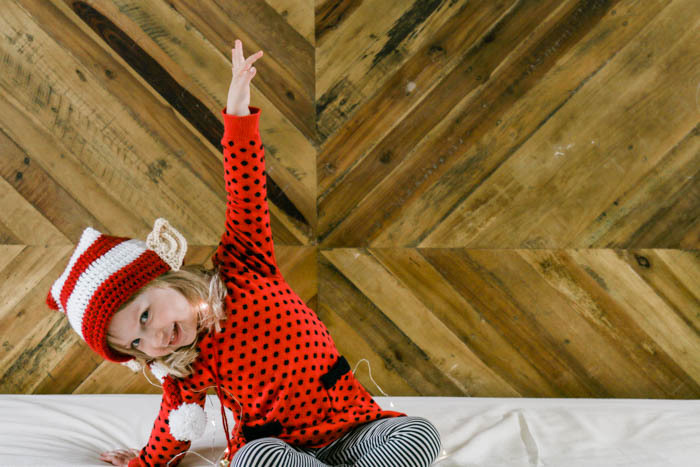 While my kids just love feeling like they’re part of Santa’s crew when they play outside in the Colorado cold, I also love the idea of dressing up your whole family in crochet elf hats for your Christmas card photo. Wouldn’t a family of elves make for a charming family Christmas card? 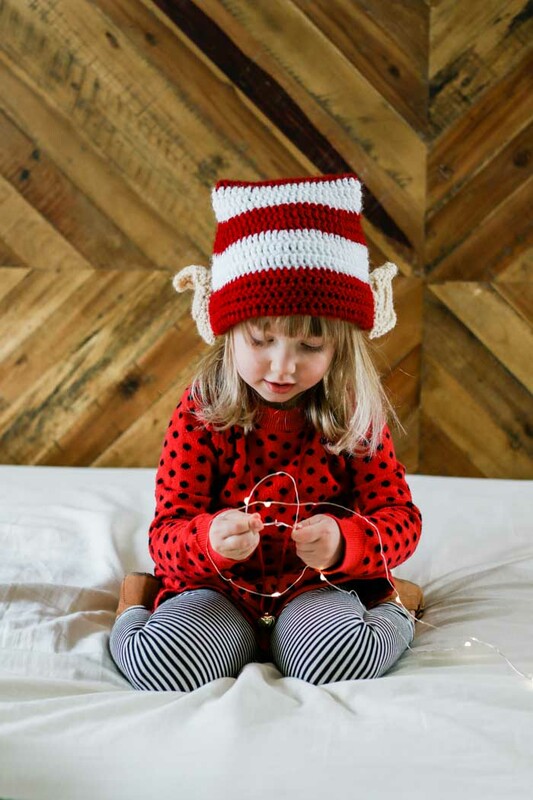 Since this free crochet elf hat pattern comes in sizes newborn, baby, toddler, child, teen and adult, no elf has to be left behind this holiday season. • Vanna’s Choice is worsted weight, so it’s pretty fast to work with and also easy to substitute if it’s not available in your neck of the woods. • It’s machine washable for all the messy elves out there. Working in Santa’s workshop can be a dirty job, you know. If you’re like me and it’s the very last minute and you’re searching for a quick crochet Christmas gift idea, look no further! 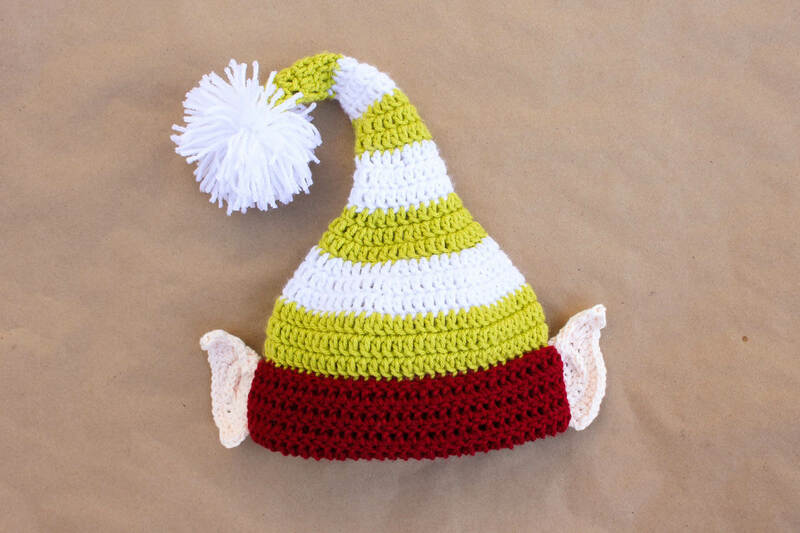 This crochet elf hat can be made in a few hours thanks to the quick double crochet stitches. 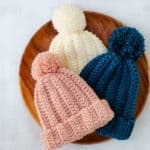 You’ll begin at the very tip top of the long tail working in the round and crochet your way down to the brim of the hat, WITHOUT cutting your yarn to switch colors for the stripes. Once you get the hang of this easy pattern, I know you’ll want to elf-up everyone on your Christmas list! 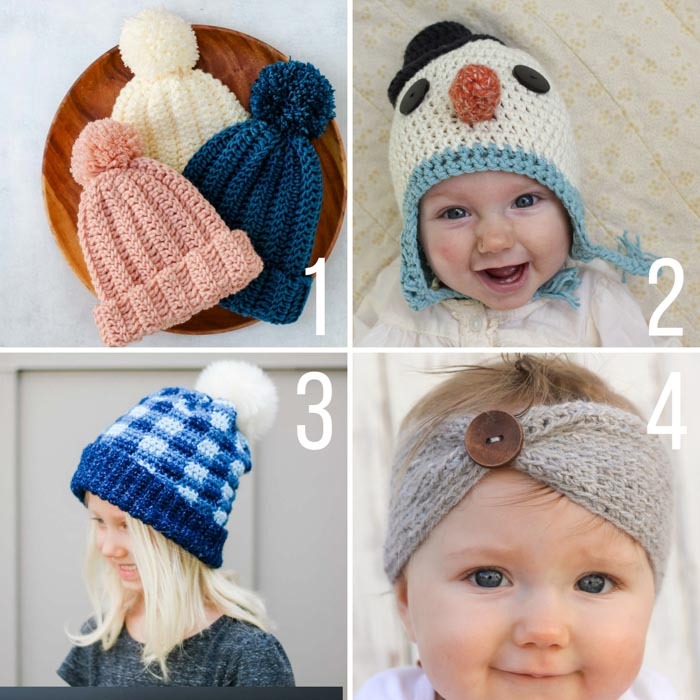 If you have a gaggle of kiddos in your family, you might also enjoy these other free crochet hat and headband patterns for kids. You can always look through our free crochet patterns for babies and kids too. 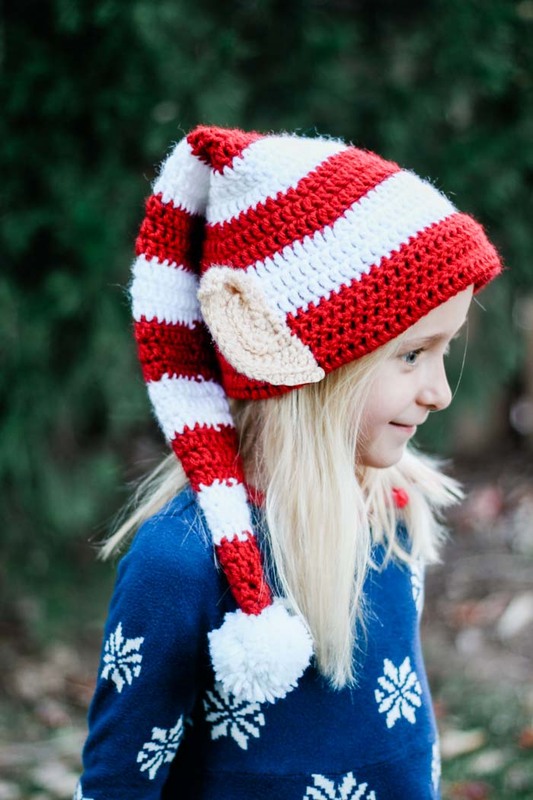 Written in sizes newborn-adult, so no elf needs to be left behind this Christmas season. For most accurate sizing, measure recipient’s head circumference and choose size accordingly. When meeting gauge, the finished hat will fit loosely when recipient is on the smaller end of the size range. If a more snug fit is desired, size down. • Pattern is worked from the top down in one piece. • To change colors between rows, work the final yarn over of the last dc of the row with the new color. Pattern is written with the assumption that the last dc and final sl st before a color change row will be worked this way. • Do not cut yarn after color changes. Instead, simply keep it attached in inside of hat. Reference note at beginning of each round for which color yarn is used. • For a less noticeable join, work ch-3 at beginning of each row fairly tightly. This ch-3 counts as a dc throughout. Foundation: Make a magic ring using Color A. Continue with instructions for appropriate size. Fasten off both colors, leaving a 35” tail of Color A. • See photo below for ear detail. Foundation: Make a magic ring using Color C.
Row 6: Ch 3 (Counts as first dc), dc in first sc, sc in next sc, sl st in next 9 sc, sc in next sc, (2 dc, tr, dc) in next sc, sc in next sc, sl st in next 4 sc; turn. Row 7: Ch 1, sl st in next 6 sts, (2 dc, tr) in next st, 3 sl st down the side of tr just made, sl st in each st to end of row. Fasten off, leaving a 20” tail. Inner Ear Ridge: Attach yarn to Row 4, mid ear, above lobe. (See photo B.) 7 sc along curve of Row 4. Fasten off. Repeat for second ear, except work Inner Ear Ridge on the WS of ear, creating a mirror image of first ear. Row 7: Ch 3 (counts as first dc) dc in first sc, sc in next sc, sl st in next 12 sc, sc in next sc, (2 dc, tr, dc) in next sc, sc in next sc, sl st in next 4 sc; turn. Row 8: Ch 1, sl st in next 6 sts, (2 dc, tr) in next st, 3 sl st down the side of tr just made, sl st in each st to end of row. Fasten off, leaving a 20” tail. Inner Ear Ridge: Attach yarn to Row 4, mid ear, above lobe. (See photo B.) 9 sc along curve of Row 4. Fasten off. 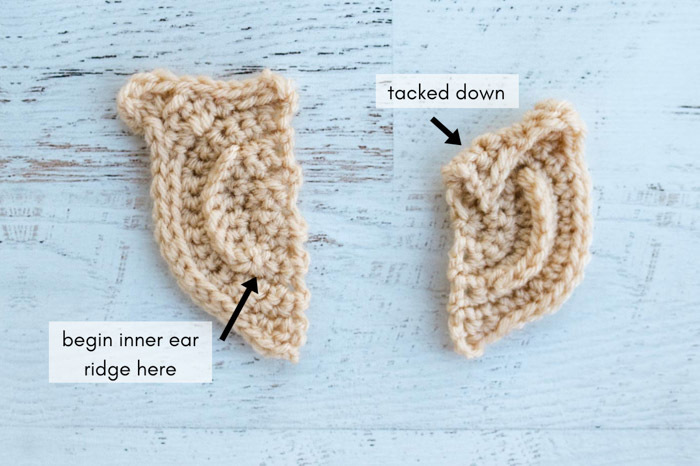 Using tapestry needle and skin-colored yarn, tack down top inner edge of both ears. For best ear placement on hat, attach them in the same position the wearer’s real ears will be. (This means there is slightly less room between the ears in the back of the hat than in the front.) Let the lobes hang below the Color A cuff a bit. With skin-colored yarn, sew ears onto hat using a whip stitch. Create a pom-pom, tie jingle bell inside it if desired. (Avoid adding a jingle bell if the recipient is under 3-years-old due to risk of choking.) Attach pom-pom to the top of hat. Here’s a DIY pom-pom tutorial if you need help. Call up Santa because you’re ready to be put to work! 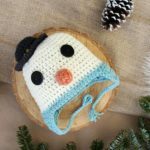 If you’re on the hunt for more free crochet Christmas patterns, we have some you might really enjoy. 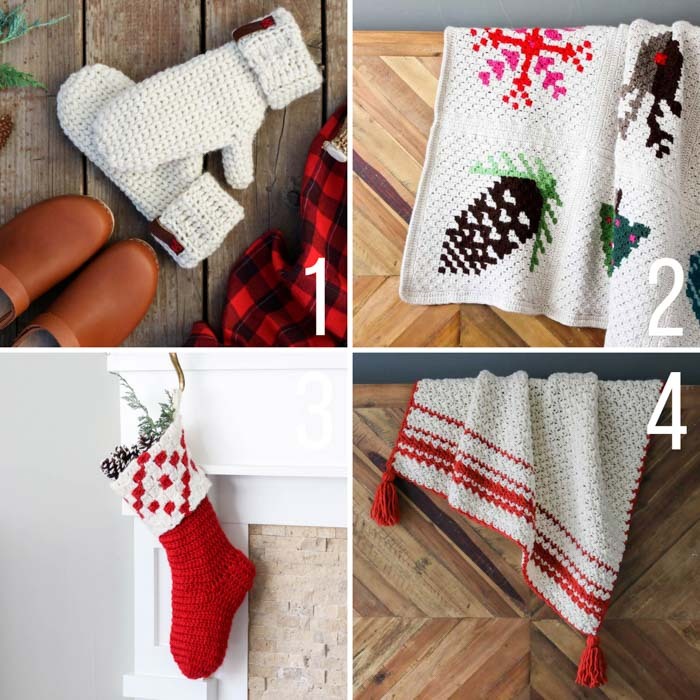 From quick gifts to family heirlooms, you can search our crochet Christmas pattern archives or check out the free patterns below. 1. 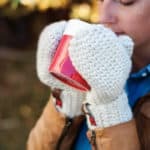 Morning Mittens – Free crochet mitten pattern that looks knit, but is actually crochet! 2. Modern C2C Crochet Graphgan – This nine square Christmas C2C crochet blanket will be treasured forever. 3. Stockholm Stocking – A minimalist-inspired crochet Christmas stocking for modern mantles. 4. Hygge Holiday Throw – This is a quick crochet blanket that can be enjoyed all winter long. This hat is so cute, and I love the elf ears!!! Thanks for sharing this pattern. i totally adore the ears!! 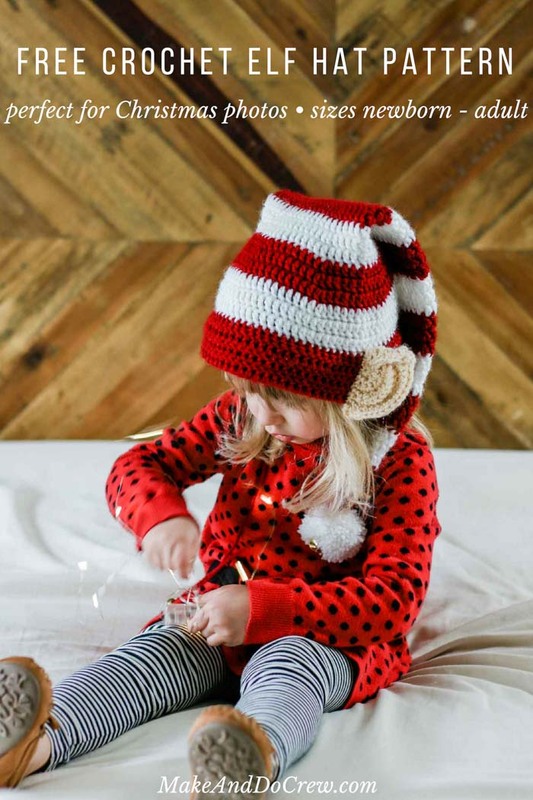 such a great crochet elf hat, thanks for sharing the pattern! I love the ears too 🙂 Thanks so much for visiting. Happy crocheting season! I signed up for the emails to get the additional sizes and I just keep getting the same 0-3 mth size. Where or how can I get the additional sizes? Have you gone to the Vault and entered the password? The full pattern is the link that’s right underneath the photo of this pattern in the Vault. Thanks so much, Cyndi! I am having fun too! And I love knowing my patterns are useful to you. I cant get any information on what the password is to get into the vault and get the additional sizes? Cute hat pattern. I have been knitting a hat for a gift for the last few days – almost done with it. Pinned the pattern to my crochet board. Kimberlee, thanks so much for pinning my pattern. I sincerely appreciate it! I love last minute DIY gifts. Best of luck finishing your hat before Christmas! Ha! You sound like me–always onto the next project. It’s kind of exhausting having so many ideas, isn’t it? Love this pattern!! But i signed up on your page and cannot find the other sizes that are supposed to be available??? I see where is says to download additional sizes but there is no link to click on. At the bottom of the post, above this comment section, there is a box to enter your email address. When you do that, you’ll immediately get a link to the Make and Do Crew subscriber exclusive area where you can download a PDF of the additional sizes. Check your spam folder if you don’t see the email right away. The password is in the email you received and it’s the same for everyone. You should have received an email from me with a link to the Vault. Did you get into the Vault? If so, the full pattern is in the link right below the photo of the hat. If you haven’t gotten the email, please search your inbox for “Make and Do Crew” and let me know if you don’t find it. I love this elf hat. It is April and I am already planning my Christmas card????. I am just a beginner, and have the basics down. I am although a visual learner and still trying to understand when I read patterns. I have a question that might be silly but I just want to be sure I am doing it correctly. When it says (2DC in first stitch, DC in next 5 stitches) repeat around” it means to me put 2 double crochets in the first stitch and 1 double crochet all the way around. I just don’t understand what DC in next 5 stitches means. Thanks for any help you can give me. Put 2 DC stitches in the first stitch of the round. Hi, I am having troubles understanding the pattern, what do you have to do with the 2 stiches you chain? You just join them in the round? And if you keep chaining and double crocheting, you end up with more than 6DC in the first 5 rounds??? I’m not sure I’m totally understanding your question, but if you’re referencing the two chains at the beginning of each round, they are there to serve as the first double crochet of the round to essentially create a “step up” for the next round. The password is in the email you received from Make and Do Crew. Check your junk/spam folder if you don’t see it when you search your inbox. The password is the same for everyone and case/space sensitive. That is such a great idea, Nancy! I bet they’ll love a little elf helping them out 🙂 My daughter wears this hat and then pretends to be someone named “Sally” who is a super helpful elf. Haha. I’ll take whatever kind of helpful kid I can get! And I agree, crocheting keeps me sane (or at least sort of sane) too! Hi! I have a question about the pattern. On the 3-6 months size, round 19, I am getting 54 stitches instead of 49. I did get 49 stitches in round 18 but should it increase in round 19? Thanks!! Hi, hoping for the adult size for this pattern. Thanks! The adult size is in the subscriber “vault.” If you enter your email address in the box on the right side of the page or at the bottom of this post, you’ll immediatly receive an email that tells you how to access the other sizes of this pattern, plus a bunch of other free patterns and templates. Hi! I’ve been going around in circles trying to get adult & child sizes of this pattern. I’ve done the write in email address thing 2 times and end up right back here – IN the vault!!!. I’ve read all you comment replies on this and I don’t see how those people got to the bigger size patterns either! Let me know if that works for you. If there’s something broken in my process, I’d like to know about it so that I can fix it for others. Thanks so much! You don’t click on “Tutorial Here” If you click on the “Here” it takes you to the original tutorial. I’m a little confused by the picture that you have posted and the pattern. The picture ends with green and then the red, but your pattern has you doing two rows of white (rows 17 and 18) then the 5 rows of red. Great catch, Sarah! You’re right. Are you crocheting the newborn size? (The one that’s in the blog post?) That size is a bit smaller and therefore has a different number of stripes than the toddler size, which is pictured. Does that clear things up? Let me know if not! Yes I was doing the newborn size. Its a bit confusing to see the picture of a larger size then the posted pattern size but I understand now. I entered my email, but am not getting a response for the different sizes. Boo! Sometimes it can get stuck in your spam folder. Did you search your email for Make and Do Crew? If it’s not showing up, you might want to just try subscribing again. (You won’t get subscribed for multiple emails.) If none of that works, send me an email at jess (at) makeanddocrew (dot) com. We’ll get you what you need! I entered the my email. The email I received did not have a clickable link. I emailed you directly and the link you provided brought me back here after entering the password. I believe I emailed you back. Were you able to get your hands on the pattern? The link just brought me here after entering the password. No, I didn’t get the pattern, unfortunately. Helen, once you enter the password, you have to click on the name of the pattern, not the “tutorial here” part. Took me about 30 minutes to figure it out! Good luck! Thanks for helping out, Karen! Yes, the “tutorial here” is simply a quick and easy way to get back to the blog post so that you can reference it if you’d like to. Want to make an elf hat for a 1 year old who wears18 month clothes. Thank you! If you subscribe in the box above this comment area, you’ll receive an email to download the additional sizes of the pattern. I am finishing the ears on this hat, but I’m stuck on the single crochet ridge in the middle. Can you give an instruction for how to do that? Please let me know if not. I’m happy to explain it another way. Thank you for your response. I was trying to crochet around the other single crochets and I couldn’t make it work. Am I pretty much just picking up a loop in the post of the single crochet to attach it and start the ridge? love these! would love to do adult sizes!! If you subscribe in the box at the bottom of the pattern, you’ll receive an email with a link to access the other sizes of the pattern (for free :). I would like the pattern for the different sized elf hats please. Thank you! If you subscribe in the box above this comment area you’ll get an email that tells you how to access the larger sizes. Downloaded the pattern without issues, but what is the gauge for this hat?! I crochet loose, and am usually 2 hook sizes smaller than the pattern states, but without gauge I’m lost! I’m sorry about that. I just added the gauge to the pattern. 7 DC = 2 inches and 3.5 rows = 2 inches. 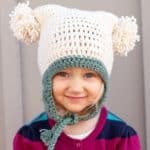 I love the hat, and would like to make several for my cousins’ toddlers for Christmas. Did you happen to have a gauge for this pattern? I reduced down to a 4.25mm hook, but the hat’s are coming out too large (I’m aiming for a 18″ circumference). I must be using thicker yarn, or a looser DC (or both). I have the alternate sizes and am reading through the pattern before I start. I am confused because round 7 joins with green and then the next “join” is in round 10 but it says join using white. Then the next join in round 13 says join using green. Should the round 10 join be using white instead of green? It alternates ever few rows between white and green. So when it says “join with white,” it’s referring to the fact that you’ll want to slip stitch into the 2nd chain at the beginning of the row using the color of the new section you’re about to start. This makes the seam invisible. So in row 10, you’re joining with white because you’re just about to start a white section. How adorable! I wanna make one for my baby! Boo! Have you searched your inbox and checked your spam folder? Try searching “Make and Do Crew.” Let me know if you still don’t find it! Haha–I’ll see if I can think of a “cool” design for next year. I love that you make him an annual hat. I bet he has quite the awesome collection! This is adorable! The ears! This pattern is so cute! Love the colours and design. Glad I found you at Hookin’ on Hump Day link party! The PW is in the welcome email you should have received from me. It’s the same for everyone and it’s case and space sensitive. If you haven’t seen the email, search your junk and spam, sometimes it gets caught in there! Well with the first 2 dcs plus the first round of the brackets gives a total of 5, to repeat the brackets again it would then give a total of 8.. do I just add another dc in the last dc to make the total of 9? Yes! Lol, what I have there doesn’t make much sense does it? I’m not sure what went wrong when I was writing that part of the pattern, but here’s what I’ve updated it to. Let me know if it makes sense to you and thank you so much for pointing that out! The email password is not working for me. Nothing happens when I put in the password. I have been copying and pasting but the password page is all I get. I’m sorry you’re having trouble. If the PW page is just refreshing, it means that the PW hasn’t been entered exactly correctly. Perhaps there’s an extra space before or after the password that snuck in when you copied and pasted it. Is the 1/9 hook a 2.25mm ? I loved this pattern! It was so easy to read and understand. I made several hats for my kid and friend’s kids and they were a big hit. Thank you! Yay! I’m so happy to hear that, Jessica! I would love to get the larger size directions for this! Made 2 of these for my daughter & friend who were Santa’s helpers at the school PTO craft fair. Had a request to make 4 more for a family that attended the fair. When changing colors, did you cut the yarn or did you carry the yarn over? I started cutting the yarn and using magic knot, but am now wondering if carrying the yarn would be safer. Thanks for sharing your patterns. Love your creativity. So glad the pattern has gotten some good use by your daughter and her friend. That sounds adorable! I made this hat tonight and will finish it off tomorrow for my almost 3 month old Grandson. The hat was easy but the ears took a few tries! I’m starching the ears a bit to make them a bit stiffer. Will see how it all comes together. Thanks for sharing this pattern! I’m planning to make 3 adult hats. How much yarn do you think I’ll need? Hi Patti! If you subscribe to the emails, you will be sent access to the additional sizing information. It will show how much yarn you will need for the adult size. Hope that helps! It’s case and space sensitive, so make sure you’re entering it exactly as you received it with no space between the words. Let me know if you still need more help. I am having trouble with the 6-12 month size. Rounds 20-22 seem to be missing. Rounds 20-24 are the red section of the hat. I hope this is helpful and thanks for bringing this mistake to my attention!